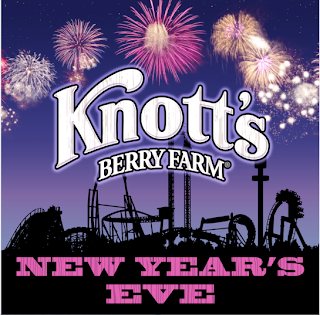 I'm really excited to be invited by Knott's Berry Farm to spend New Years Eve at their park with my family. It's difficult to find age appropriate activities for kids at New Years, and this has got to be the closest thing to a perfect New Years Eve for my 9 year old daughter and 11 year old nephew. Knott's New Years Eve Celebration starts at 10am and runs right through the day and into the wee hours of the night to 1am! Extended park hours, live entertainment, and a fireworks display are all included in the price of regular park admission. Special one-night-only entertainment serves up family fun for a variety of ages and interests, including the Midnight Party on the Midway! Count down the New Year with music, stilt walkers, party hats, and noisemakers for everyone. And new this year, the Knott’s Sky Cabin, adorned with special lighting effects, will dramatically rise to the top of the “K” tower to count down the final moments of 2013. The cabin will reach the top at the stroke of midnight and the skies above Knott’s will be ablaze with colorful fireworks! • Krazy Kirk & The Hillbillies! From the deep country hills of Anaheim, these boys will have toes tappin’ hands clappin’ and guts bustin’ during the best darn musical comedy show ever performed on the Wilderness Dance Hall stage. • The Reflexx, the ultimate 80’s party band, headlines the Calico Square Stage with a blast to the past of radical music from Depeche Mode, Flock of Seagulls, A-Ha, and more. And before The Reflexx take the stage, DJ REESSO spins popular high energy music in the Calico Square. • Comedy Magic of Dana Daniels will fill the Boardwalk Ballroom with uproarious laughter as he combines clean comedy, astounding magic, and a psychic parrot in his show. • Sharp Turn Ahead will headline the Camp Snoopy Theater with the up-and-coming teen duo’s fresh combination of energetic acoustic guitar and smooth keys, playing original tunes and covers of today’s pop hits. • Salsa Dancing with Louie Angon, DJ JC & Snoopy invite you to show off your dance movees at Fiesta Plaza and groove to the beat of this spicy music scene that’s Hot Hot Hot! If you have a 2014 Season Pass the value is even better, because each 2014 Season Pass includes one FREE visit in 2013 that can be used on New Year’s Eve!